Which Are Best Tail Bags For Horses On The Market? Washing a tail is never anyone’s favorite job. There’s the danger of being kicked, trodden on, flicked in the face with a sodden tail – and then there’s the thought of what you’re actually washing off said tail. Not nice. But, a tail wash not only makes your four legged friend look nice, but sprucing up his tail will also help it be a more effective fly swat, so it should be done on a regular-ish basis, whether for a show or just for good maintenance. Once that tail is all washed and fresh, it’s nice to keep it that way for as long as possible – especially if the washing was done for a show. A tail bag is the best thing to keep your horse’s tail spotless as well as free from burrs or bits of shavings – but which is the best tail bag for horses that you can find? We have picked out a few good products for you. This is a full length tail bag that will help keep your horse’s tresses as clean and dirt-free as possible, for as long as you need. Perfect for travelling in a box or keeping the tail clean in a stall, this will be a great go-to tail bag for the rest of time! Neoprene construction is strong, durable and easy to clean – This type of fabric is resistant to tears and rips, and is pretty much wipe clean so you can keep it in tip top condition. Touch close fastenings – This is very handy for the horse who doesn’t really like to be fiddled with, as you can quickly close the bag to keep the tail safe and secure. Padded velcro section over the tail bone – Having this bit of extra comfort is essential, especially if your horse is going to be wearing the bag for a while. Lightweight and easy to transport – This bag will literally fold into nothing for easy storage, and its small weight means your horse won’t be bothered by wearing it. It’s very long – For those whose horses have shorter tails, or even that are shorter in stature generally, it may be wise to opt for a smaller tail bag as this one may drag on the ground. A fantastic tail bag to keep your horse’s clean tail staying that way. It’s very easy to put on and take off, which adds to its convenience. This one is ideal for those who want just a half tail guard rather than a full on tail protector for the entire length. It is padded for comfort, and is suitable for the majority of horses. Padded for comfort with a non-slip lining – The fact that this tail guard is soft and padded means it will be extra comfy for your horse, and the non slip lining means that he shouldn’t be able to dislodge it easily. Adjustable fasteners for different sized tails – Whether you have a full-tailed Shire or a little Shetland, this wrap can be easily adjusted to fit any size of tail. Protects the tail against rubbing – If you have a horse who is determined to rub out the top of his tail then this wrap is for you. It will stay put and prevent the top hairs being rubbed out, maintaining your horse’s smooth line. Comes in a variety of colours – You can choose what colour you want this product in so that it matches the rest of your tack. Can be remove with determination – If you have a horse who rubs constantly, you may find the wrap on the floor of the stall or the field. A great tail wrap for those looking to prevent rubbing to the top part of the tail, either on trailer rides of in the stall. This Ripstop bag is designed to be left on your horse’s tail for long periods, and as such it is great for preventing damage caused by other horses in the pasture. Extremely strong fastening – When you have a horse who doesn’t like wearing “clothes” you will need every trick in the book to keep it firmly on him. The hook and loop fastening is very strong and designed to stand up to all sorts of abuse. Works with braided tails – For visits to the show ring this bag is great, as it has a special attachment for braided tails, where other bags do not. Water resistant fabric construction – If you are using a tail bag that your horse wears out and about, it’s no good having one that could be damaged and get covered in mould and mildew. This one will resist water damage. Prevents other horses chewing the tail – Damage caused by other horses can be very frustrating. With this bag, it’s no longer a problem! Sizes run on the small side – It may be worth ordering a size up from what you normally would, to avoid disappointment. This is a great tail bag for all weathers and all applications. It will not only prevent damage to your horse’s tail but will help it grown longer too! When you’ve washed and brushed that tail for the show ring, you want it to stay as clean and shiny as it possibly can. Tail bags for the journey and for waiting for their turn in the ring is the answer! The best tail bags for horses can not only keep your horse clean on the way to a show, but can also help prevent damage from rubbing or other horses chewing. 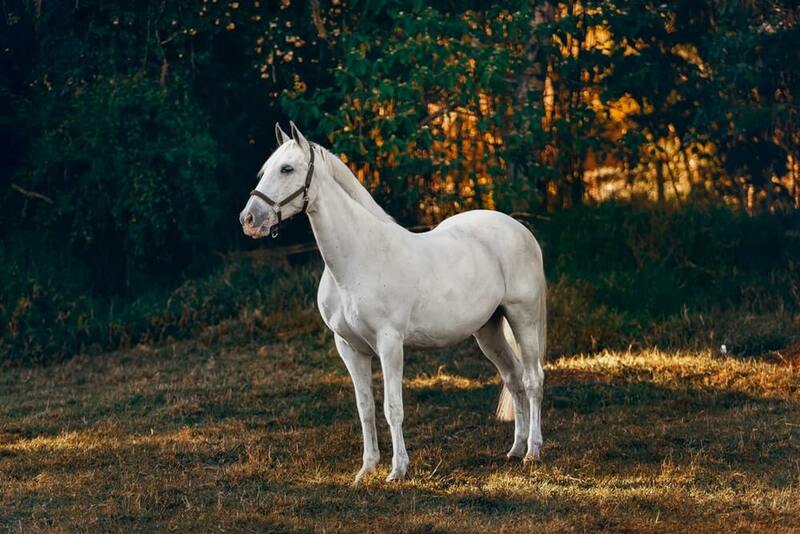 It is really sad to walk into the field and seeing your horse’s previously long, flowing tail rubbed bare, so make sure you have the means to prevent this with a good tail bag.